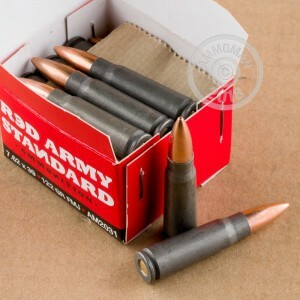 This 7.62x39mm ammunition from Red Army Standard (a brand of Century International Arms) is a highly cost-effective range load for AK and SKS rifles. Buy a few boxes and enjoy plenty of time with your guns at a low per-round price. Remember, all orders over $99 at AmmoMan.com come with free shipping to help push your costs down even further! 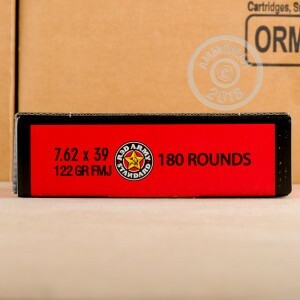 Each cartridge in this box of 20 fires a 122-grain full metal jacket bullet. This projectile weight is typical for the 7.62x39mm and produces ballistics similar to that of military ammo in this caliber. That makes these rounds great for target shooting, practice, and plinking. Red Army ammo is loaded in Bosnia and Herzegovina and Ukraine using non-corrosive Berdan primers and steel cases. 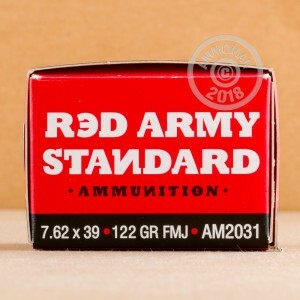 While not reloadable, the steel cases contribute significantly to the low cost of this ammo and are comparable to mil-spec components used in Soviet issue ammunition, with one notable improvement--a polymer coating that helps to provide reliable feeding and ejection.